Midfielder Joe Clarke is well aware of the importance of Wrexham's cross-border derby with Chester to the club's supporters. Wrexham make the short trip to face relegation-threatened Chester in the Conference Premier on Saturday. Chester won 2-0 at the Racecourse last August and Clarke is keen to make amends for that defeat. "All the players know what it means to the fans," Clarke said. "You see a lot on Twitter and obviously know the history of the games. "We lost to them earlier on in the season so we owe them one anyway. We'll be looking to get three points." The Dragons go into Saturday's game at the Deva Stadium looking to secure their third successive win following victories over Macclesfield and Nuneaton Town. Following Saturday's game at Chester Wrexham host Lincoln City on Monday before ending the season away to Forest Green Rovers next Saturday. "We're on a two game winning run so we want to make it three," Clarke added. "We want to get three wins from the last games and you go into next season then with a bit more confidence." 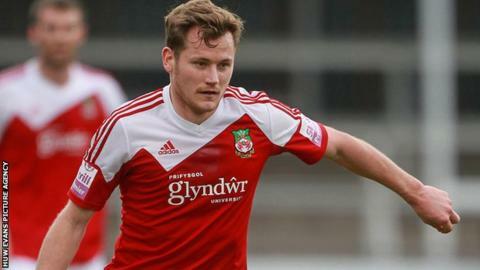 Clarke, who joined Wrexham from Darlington in 2010, is out of contract at the end of the current season. Manager Kevin Wilkin has begun contract talks with members of his squad and 25-year-old Clarke is hoping to earn a new deal. "I'm keen to stay but I haven't been offered a deal yet so we'll see what happens," Clarke said. "The gaffer's come in and he's got his own ideas and everyone's bought into them. "He's got on really well with everyone and we want to work hard for him. "Any chance you can get, whether it's training or games, you want to try and impress. "On a personal level you want to do well and obviously earn yourself a new deal for next year."